The severe case of the horrendous neglect of the Surabaya Zoo animals in Indonesia has been tediously going on for years. It has come to the point now where all neglect, abuse and diseases causing multiple deaths is known world wide, yet still nothing of substance is being done to allow professional aid to these animals. Additionally, the ongoing internal conflict of the zoo management along with the unprofessional management by political elements show that it is clear that the animals these people are deemed to care for and protect, are prioritised last. The neglect and abuse goes on. This petition address's 3 issues..
2. For the President of Indonesia and the Minister of Forests to step in and end the internal conflict with management inside Surabaya Zoo, and end the political elements involved in Surabaya Zoo, which are the sole reason for the severe stagnation of all animal welfare and the continued and heightened neglect of the Surabaya Zoo Animals. 3. To implore the Minister of Health to address the disease aspect of Surabaya Zoo, due to the contagious-to-humans Tuberculosis and Hepatitis prevelant within the zoo, and as an Occupational Health and Safety threat to both humans and animals, which in worst case scenario could result in innocent tourists being contaminated, or an outbreak. This petition is to urge the Indonesia authorities to work in unison to bring urgent aid to the Surabaya Zoo Animals, to end the internal conflict of management in the Zoo, and to end the political interference which is preventing aid getting to the Surabaya Zoo animals. The plight and long term suffering of the Surabaya Zoo Animals has been heavily documented around the world. 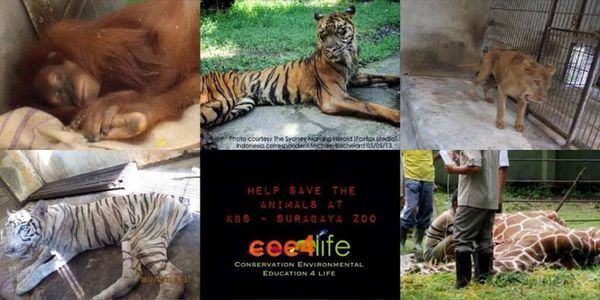 It has become a clear example of human interference causing severe detriment to the animals within the Surabaya Zoo. The sad fact is that personality clashes between political figures and professional animal experts, combined with the internal conflict of the zoo management, has obviously taking priority over the humane care of the animals residing within Surabaya Zoo, which they are deemed to care for them. While the professional animal experts have persistenly tried to give humane aid to the suffering animals, there has been political and zoo mangement detractors working against this humane aid, preventing any and all aid getting to the sick and dying animals of Surabaya Zoo. It is also a petition to urge all health and safety barriers to be immediately implemented due to the known contagious human to animal/animal to human diseases prevelant within the Surabaya Zoo. The high risk of infection contaminating innocent tourists is being currently ignored again due to the internal conflict of the zoo and interference by political interference. 1. That immediate veterinary aid is allowed inside the Surabaya Zoo to treat all ill, sick and ailing animals. 3. That this Veterinary aid and enclosure upgrading is headed by a team chosen by Indonesian Zoos and Aquariums. 5. That all personal responsible for the internal conflict within management and staff within Surabaya Zoo is to end this conflict now or be removed from their positions of employment and replaced with vetted ethical staff. 6. That outside aid from animal welfare and conservation groups be encouraged and accepted. 7. That outside aid for education on animal husbandry, animal welfare and conservation by conservation, animal welfare and environmental groups be encouraged and accepted for the staff of Surabaya Zoo. In these days, we see so much abuse towards animals in the wild and in captivity. From years of study and research, we humans know a great deal more on how to treat the creatures and the environment. Please implement the above requests as it is the both the humane thing to do and the most professional. Humanity is a very desired quality, please show the world that it exists for the Surabaya Zoo Animals.